On Monday, while watching the entire first three (last three? the original three?) Star Wars movies on Blu-Ray (what is wrong with you George Lucas changing the movies like that?!) 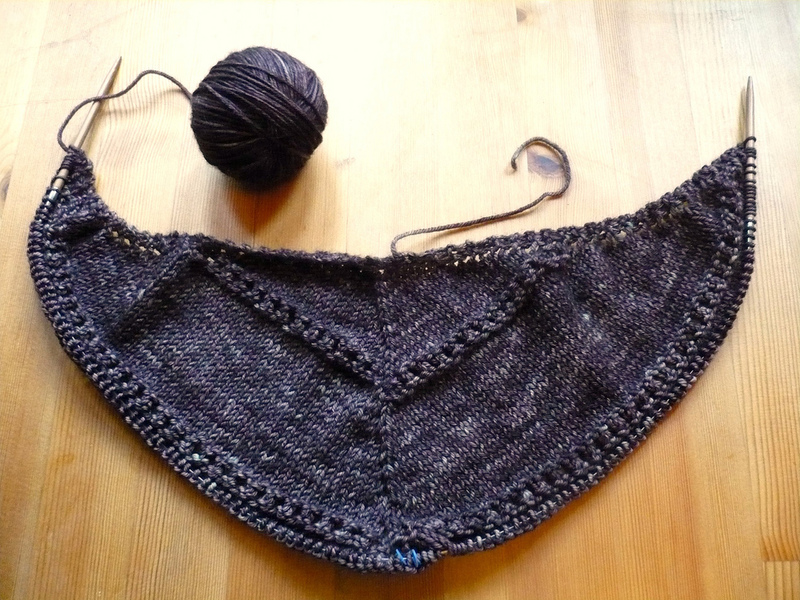 I finally started knitting the Aidez Cardigan! I bought the yarn almost a year ago and have finally now cast on! 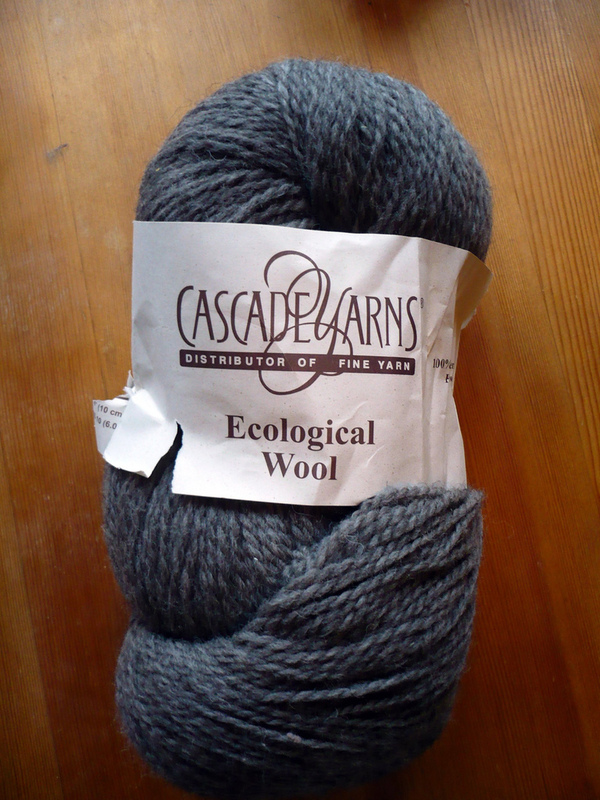 I'm using Cascade Ecological Wool in Tarnish (colour #8049). Eco is 100% undyed sheep's wool and is so squishy and springy - I just love it! It's so fun thinking that this is the actual colour of the sheep the wool came from - he must have been one nice lookin' sheep! This yarn was picked up from The Knit Cafe here in Toronto which is a pretty rockin' yarn shop! On Monday night I tweeted the above picture of the start of the back of the cardigan. 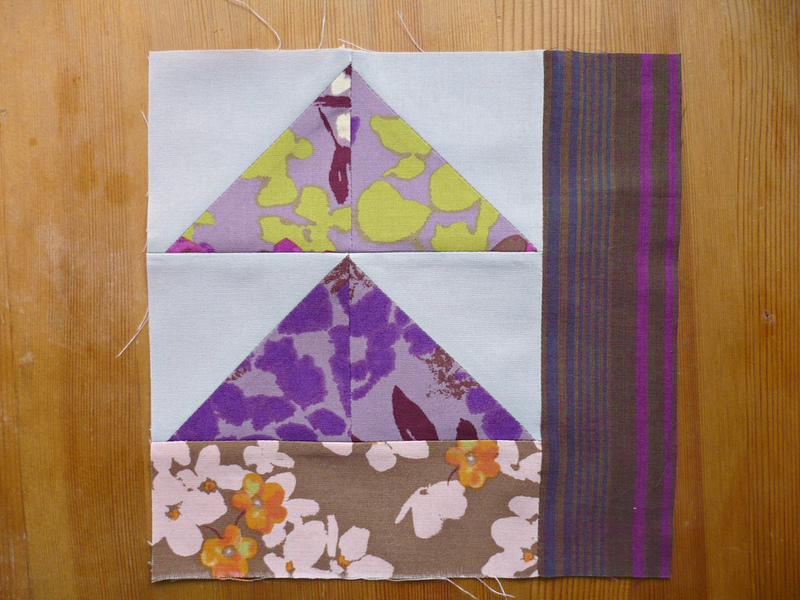 It is done in pieces (back, two fronts, and two arms) and then seamed together in the end. 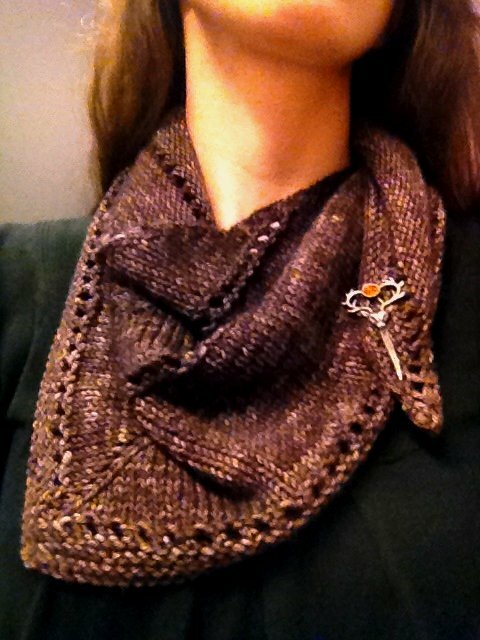 Did I mention that this is a free pattern from Berroco? And hey look, a little peek of my new Munki Munki pyjamas that Alex gave me for Hanukkah! Tuesday morning/afternoon (with a Banana Republic and Over Easy break with Alex in between) I watched some full-length Miss Marple movies that my Mum gave me for Christmas and continued to knit! The colour is off in these pictures because they were taken with the lamp beside me on - the colour is much closer to the first pictures of just the yarn on it's own. It's a really pretty mid-grey with little bits of brown highlight. 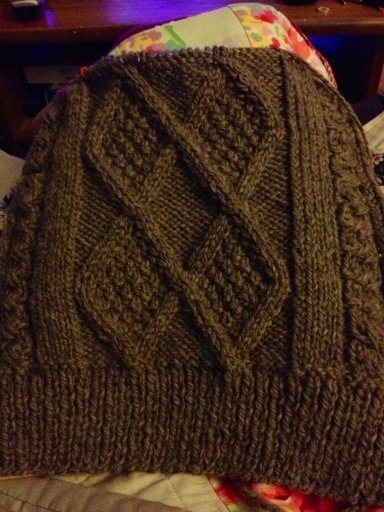 The cables on this cardi are just awesome and I could knit them forever! 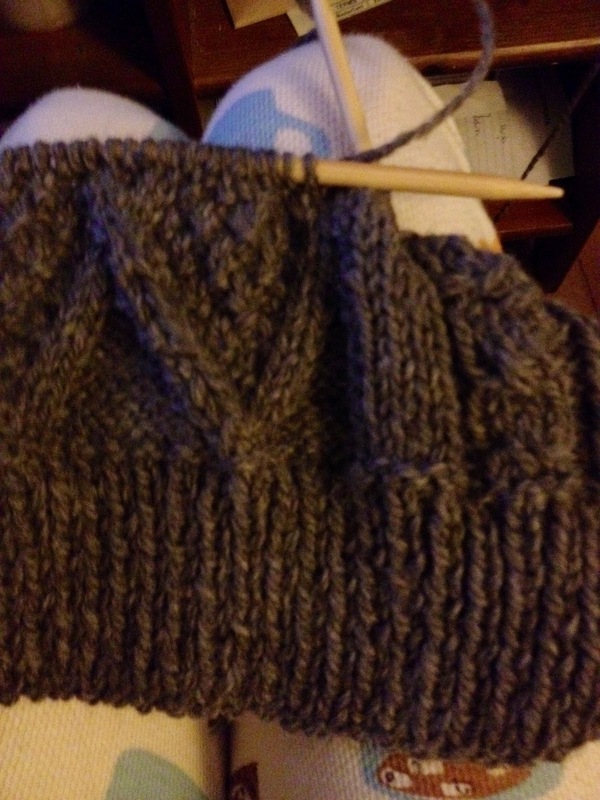 Luckily this wool is pretty bulky (it's a heavy Aran/light bulky weight) so the knitting is going pretty fast. I'm a bit further along up the back now and I can not wait to be done and show the finished product to you guys! I know this is going to be a cardi I'll wear all the time. Hey all! So how were your holidays? Did you eat too much and get the gifties you wanted? Were you driven crazy by your family or spend some time just relaxing? We celebrate Chrismukkah around here (that's both Hanukkah and Christmas for those of you not down with the lingo) and we had quite the time! I'll be back with some pictures of gifts both given and received very soon but for right now I wanted to share a little something else. Every year Sew, Mama, Sew asks bloggers and crafty peeps to share their sewing industry reflections on the past year and predictions for the upcoming year and I thought I'd take part! Oh, before beginning I'd also like to give a big shout-out to Melanie of A Sewing Journal who used my Countdown-to-Christmas Advent Calendar as one of her examples for "unexpected colour" in the article she wrote for SMS called Sewing Trends ~ Holiday Colour - thanks Melanie! 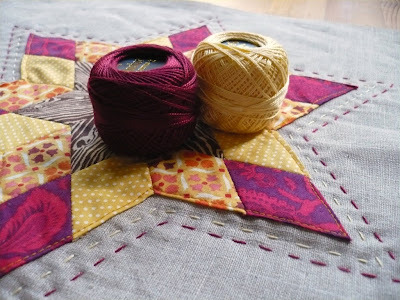 I've noticed, especially in the last few months, an eruption of more neutral coloured projects - think quilts in shades of white and creams or greys and cross stitch all done in one neutral colour (like blackwork). With many of these projects the fabrics aren't necessarily strictly neutral but can often be lightly washed shade of peony or lilac or mint. 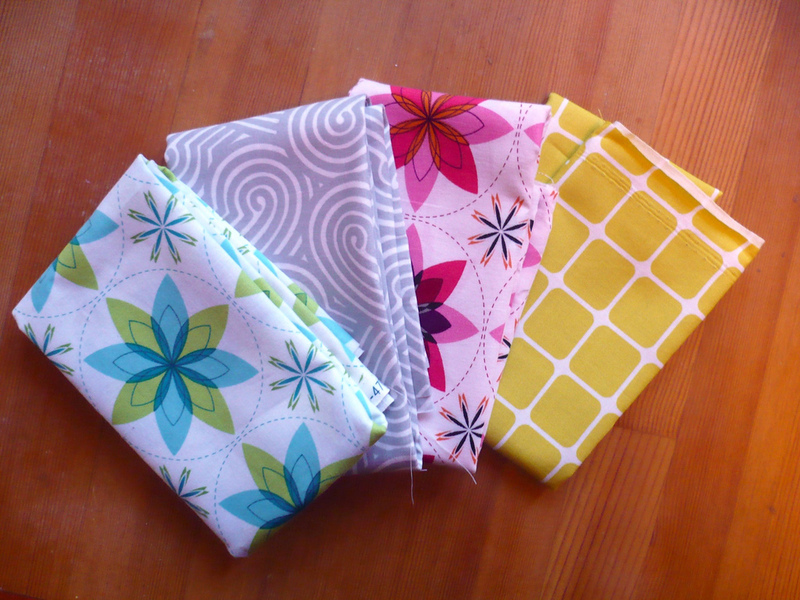 Solids have obviously been big this year and I think they'll be sticking around for awhile. 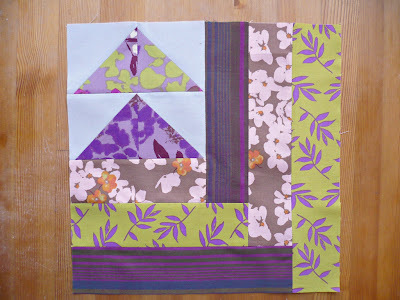 I've also noticed a surge in complex paper pieced blocks - many of these seem to be inspired by Japanese quilting books and templates while still more are designed and drawn by the quilters themselves - amazing! 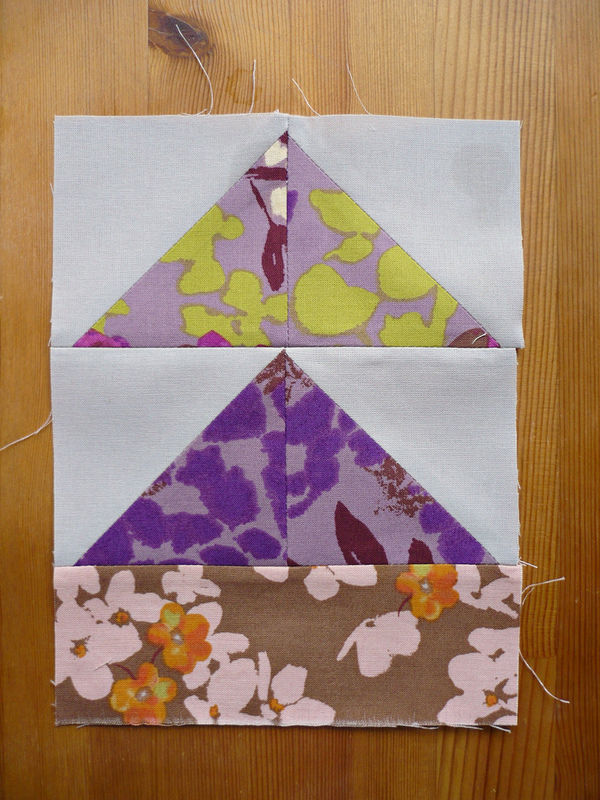 The use of different basecloths for quilts - linen and voile for example - also seemed to be pretty popular. 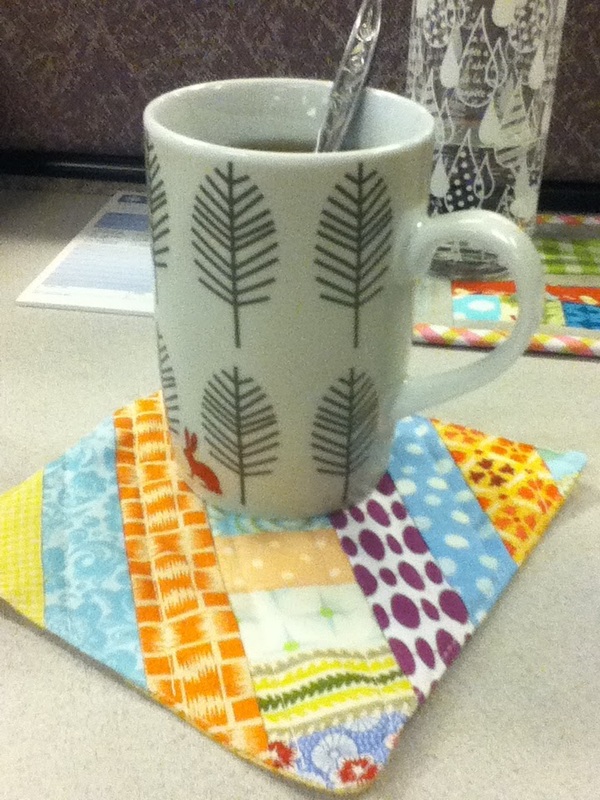 I loved seeing the start of something wonderful like Sewing Summit even if I couldn't actually attend myself. I did get to talk a little bit about it with Erin and Amy when I saw them at Quilt Market in Salt Lake City in the spring and I was so proud of them and happy for them that they started something so wonderful. Seeing all the blog posts and tweets and pictures afterwards made me extremely happy and grateful that our community was getting together and sharing with each other in a space that we could call our own. I'm not gonna lie, I was totally jealous afterwards that I couldn't afford to attend because I would have loved to have had the opportunity to hang out with all my sewing peeps, take the classes and workshops, and just be part of something that seemed so magical. Well geez, that's a hard question! I've made a number of things this year that I really loved and that were hard to let go of - let's face it I rarely make things for myself - but I think that the thing I'm most proud of may not be the best technically, and it may not be the biggest thing I've made this year, but it was made to bring a little sunshine and hope to someones day - the Life Quilt. 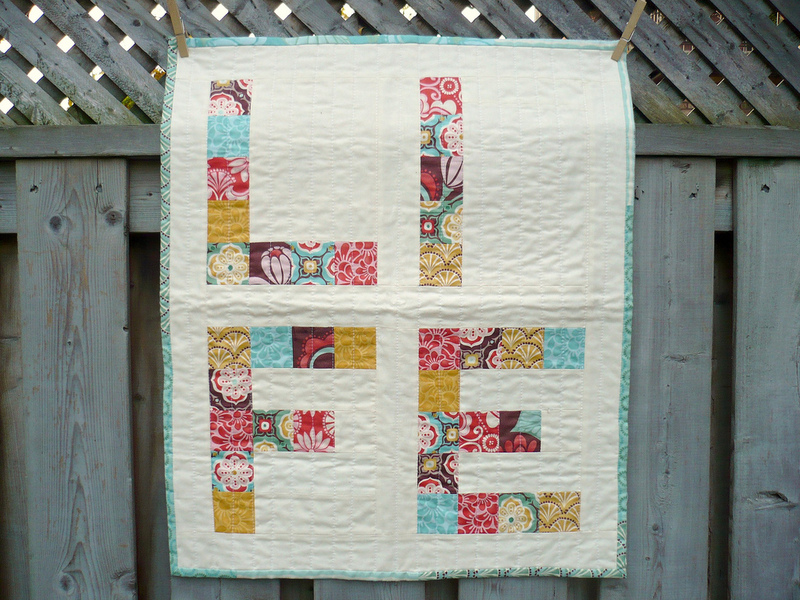 You can read a bit about the Life Quilt in this post. 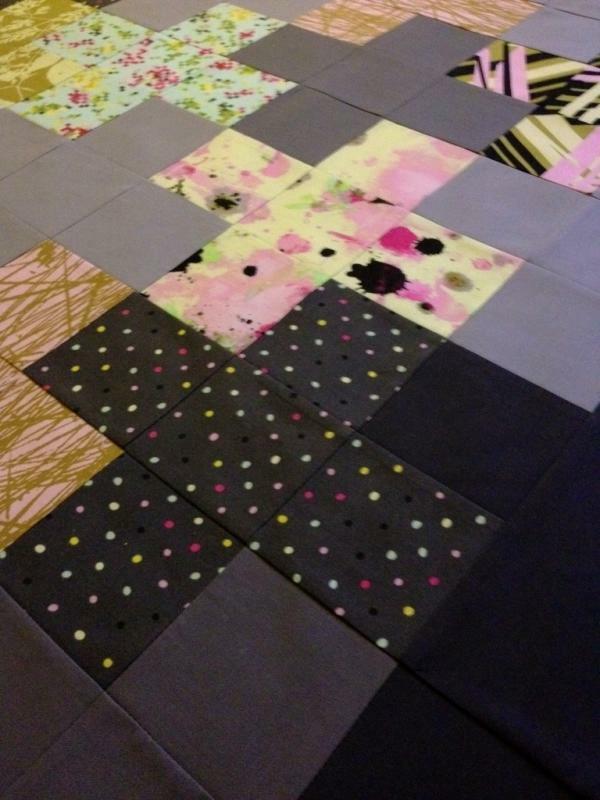 There actually is another huge quilt project, that I am keeping for myself, that I am hugely proud of but I haven't had the chance to blog about it yet so we'll discuss that in the new year! There have been so many! I am constantly inspired by the fabric selections and patterns people have chosen, and the risks they have taken! I am in love with this little piece of magic by doe-c-doe, Jeni's Sewing Circle pillow, Corey's Door block from the Ringo Pie Bee (amazing! 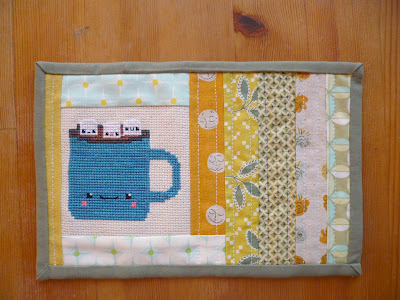 ), Quirky Granola Girl's Ski Sweater block, lizzie_broderie's Camelot Quilt, Nicole's Snow Owl pillow, good-ness's mini tribute to Japan, the Go Anywhere Bag pattern by Anna at Noodlehead, all of Angela's Swoon blocks (and her feet! ), and so so so many more! 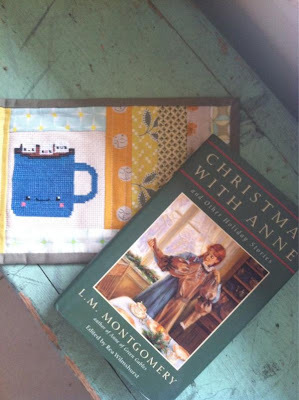 Do you have a favourite sewing book or pattern from the past year to recommend? There are a few actually but one book that really stands out in my mind is Natural Patchwork by Suzuko Koseki; also Scandinavian Stitches by Kajsa Wikman which actually came out in late 2010 but was enjoyed very much this year! Pattern wise I enjoyed many that were featured in Fat Quarterly and most all of the xStitch patterns from The Frosted Pumpkin Stitchery - such awesome, fun designs! Hmmmm, that's a hard one since I never want to "get a hate on" about anything that someone else loves, but I would say that I am kinda over the whole owl-on-everything phenomenon. I mean, really, I love owls and I use them sparingly in my own work (this kind of hearkens back to a Hemingway quote that Alex and I think is hilarious) but they do not need to be on everything. But as Amanda Carestio said in her post for SMS sometimes you think you're over something and then you see it done in a new and fun way and you're all like 'holy cow that is the most amazing thing I've seen in a long time', so you never know! I do love social media, but I must say that sometimes keeping up can be really overwhelming! I don't tweet, or pin, or roam around on Flickr as much as I used to - there is so much to see and talk about, but if I tried to keep up with it all I would never get any of my own creating done! I don't like the fact that some people have turned their entire use of social media into a vehicle for selling or for hating (um, really, that's not cool); I don't like that because of social media interactions some people feel left out or like they're not in the same league as other bloggers/designers/makers. 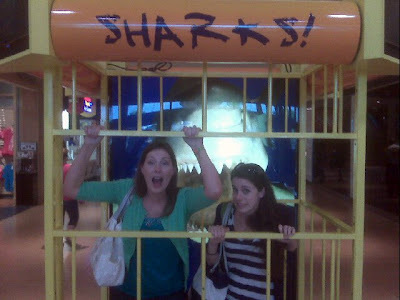 I do however love the fact that I have met many of my life-long friends through social media - without social media there would be no Jennifer and Kaye inside of a shark cage at the Mall of America *wink*! Without social media there wouldn't be a Toronto Modern Quilt Guild and I wouldn't have the opportunity to meet so many awesome, creative people in real life. 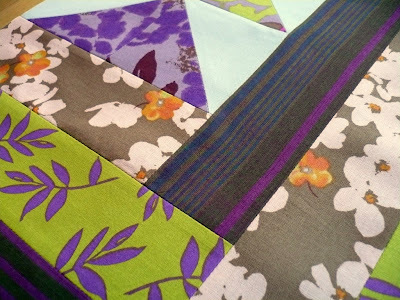 Did you have a favourite fabric collection or print in 2011? Oh, now that's another hard one! There have been some really fun collections this year but I didn't really buy very much. I absolutely adored Tula Pink's Prince Charming, Lotta Jansdotter's Echo, and Jenean Morrison's Silent Cinema (which is such a lovely, muted collection - I have a whole FQ bundle and am going to turn it into something really special I think). I predict that there will be more mixing of different types of crafty aspects together in the year to come - think patchwork and cross stitch together in one piece, hand quilting on solid decor items, and garments with special embroidered details. There has definitely been some of that this past year but I think we'll see even more of it as people attempt to make their work even more unique, interesting, and texture-rich. 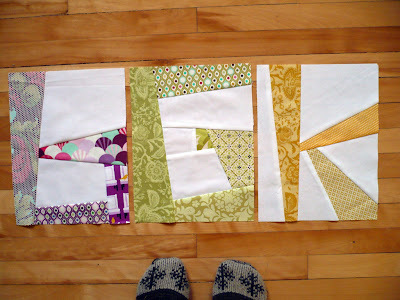 I also think that we'll see people stepping away from doing things for free - people will still offer free patterns and such on their own blogs and sites (and probably on the sites of friends) but I think we'll see a lot less of people doing free work for companies and publishers just to get exposure. Actually I think we've been seeing this already, and at least one publisher has already stepped up to the plate and admitted that it needs to change - which is really awesome! 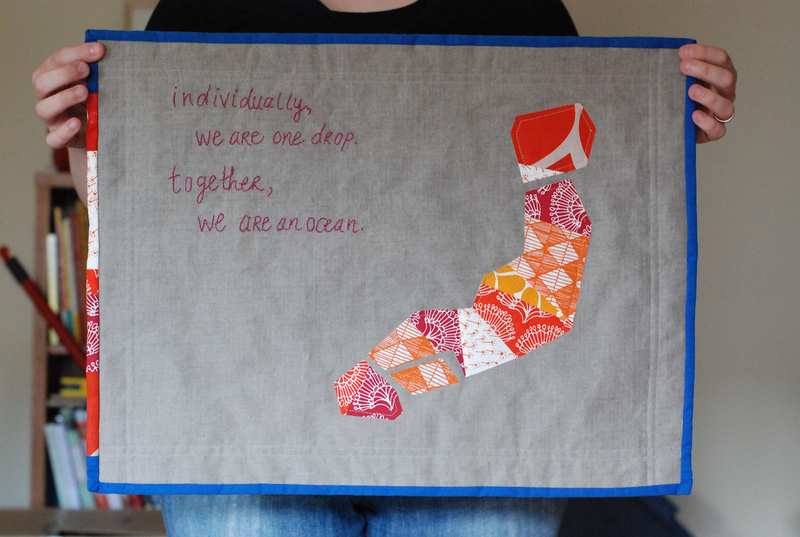 I also really hope that we'll see more opportunities for people in the sewing community to get together in person and really get to know each other. 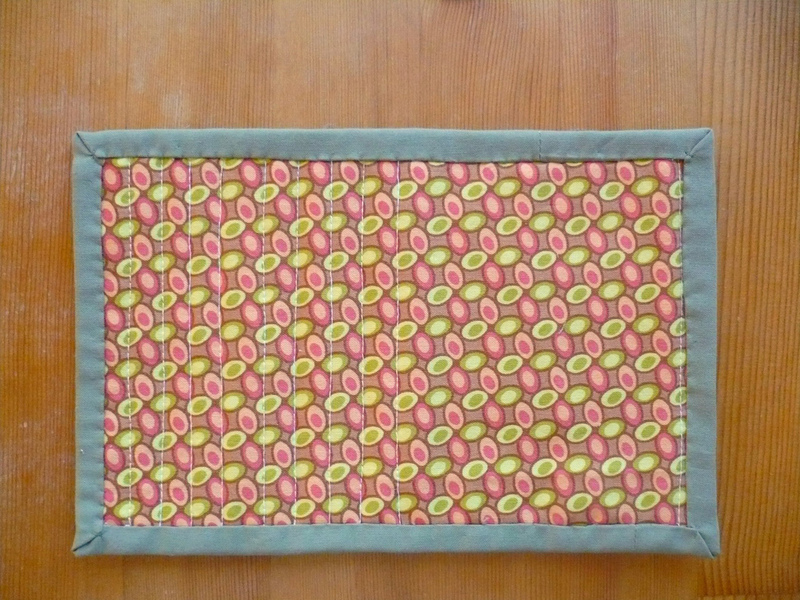 Well, I will be debuting my own line of PDF patterns in 2012 which is something that I've been working on for awhile now, but most of all I really just want to keep creating beautiful things! I don't know if any of my goals for this year are truly life-changing - I mainly try to take each project as it comes to me and work on it to the best of my ability without getting too far ahead of myself. So what are your reflections and predictions? You can find the list of questions and a linky on the SMS blog - if you'd like leave me your thoughts in the comments or a list to your blog post if you link up, I'd really like to know what you guys are thinking! Are we on the same wave-length? Have you seen some things going on in the online community that I haven't? Hey all! How's it going? I just finished day seven of a seven day work week and let me tell you - I am wiped! But there is sewing to do and a friend in from England so no rest for awhile yet especially with Hanukkah and Christmas fast approaching. I sent off a little gift to one of my bestie's, Jennifer, last week and it arrived in Maryland yesterday - huzzah! Arriving within a week was a miracle in and of itself considering the fact that I sent her some fabric way back in October that only arrived two weeks ago - Toronto to Maryland should not take two months! I made this little mug rug for Jennifer using the Je T'aime Cocoa cross stitch pattern from The Frosted Pumpkin Stitchery (which is the same company that I designed the Itching to be Stitching pattern for) and random scraps of fabric from my "string bag". 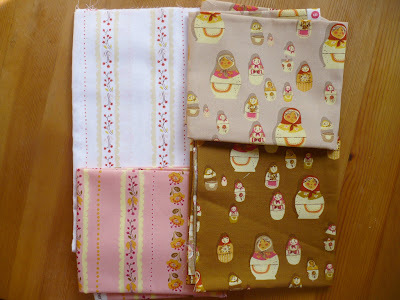 Some of the fabrics include Heather Ross' Far Far Away II, Denyse Schmidt's Hope Valley, and Heather Bailey's Nicey Jane. The one of the very far right side is from Joel Dewberry's Chestnut Hill collection (that print, in that colourway, is actually one of my favourites ever and I so wish I had more). Here's a little close-up of the cute mug and marshmallows! He got slightly warped when I ironed him but I still think he's too cute! I used some Heather Bailey Fresh Cut for the back and a greeny-khaki solid that I don't have a name for since I think I got it in the remnant bin. I also sent Jennifer a copy of Christmas with Anne and Other Holiday Stories which is a collection of Lucy Maud Montgomery stories that were published in magazines and such around the turn of the century. I have had my copy for about 14 years and read it every holiday season - I know Jennifer is going to enjoy it! 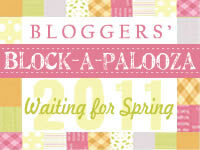 Heather D. of the blog Crafting... Congratulations Heather! 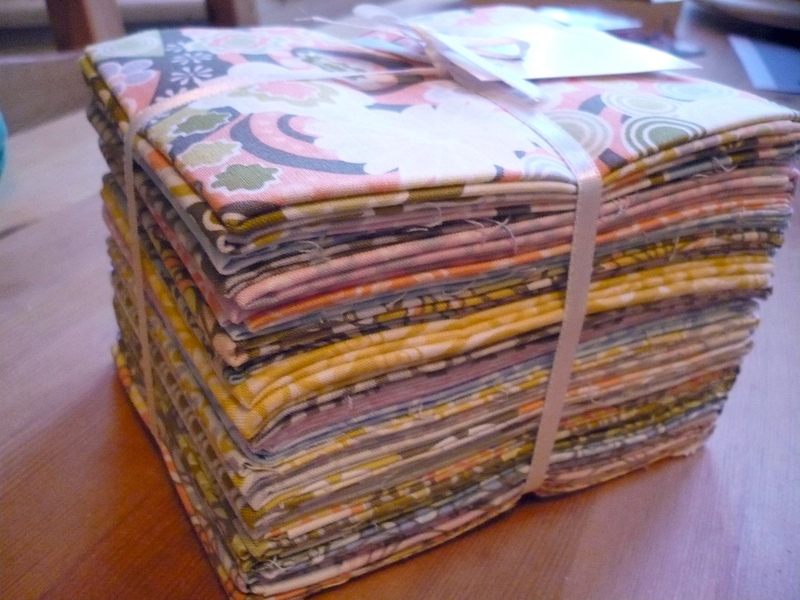 I will send you an email soon and I really hope that you enjoy the Heather Ross fabrics! So what are you sewing up this holiday season, whether as gifts or for yourself? I want to know! Yup, that's right! Awhile back John asked me if I'd like to contribute to a book he was writing - of course I said yes! 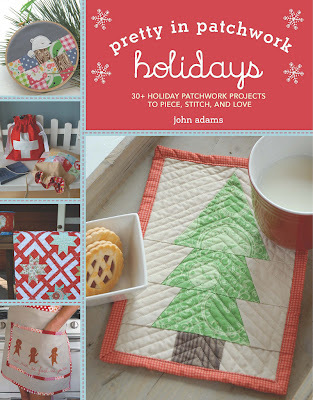 The result of this is the above book Pretty in Patchwork: Holidays! It is currently available as an e-book and will be released in print in the summer of 2012...which means that I will of course be blogging about it again when that happens! The book is full of really amazing projects and designers (I'm sure you will recognize most if not all of them) - contrary to what you might think not all of the projects are Christmas-related... there are also projects for Hanukkah and Thanksgiving as well as variations for even more. 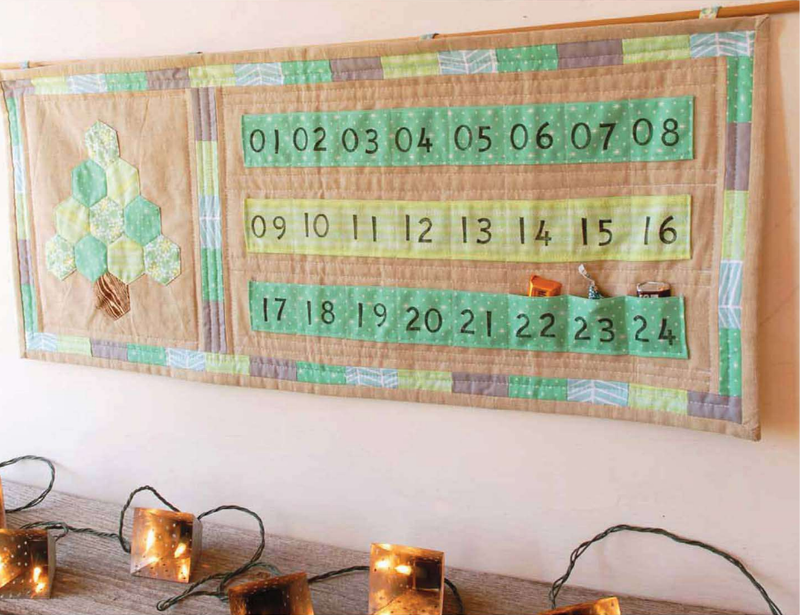 This is the project that I designed for the book - the Countdown-to-Christmas Advent Calender! 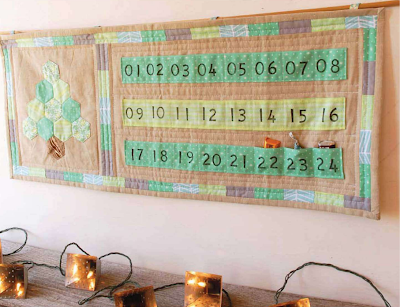 The tree is made using paper pieced hexagons and the letters are stamped onto the fabric using number stamps and an ink pad suitable for fabric. The pockets are just big enough for a small toy or small chocolate and are very simple to make. 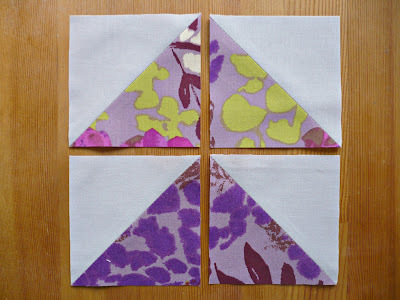 Jeni (who also had a super-cute bunting project in the book) has already actually made a variation on my pattern and blogged about it - it's so awesome! You can buy the e-book here if you'd like and one neat feature is that you can actually flip through the whole book before buying and see all the project - did I mention there over 30 of them?! Geez guys, I'm so excited! 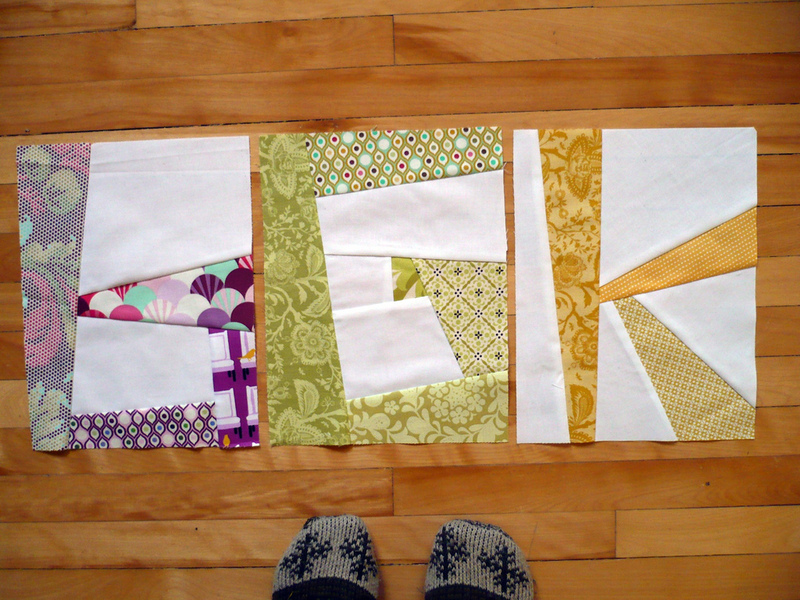 It's so awesome to finally see it and I know I'll be even more excited when the print version comes out - you can be guaranteed there will be some goofy picture of me holding it in a bookstore (I mean, really, have you guys seen the pictures of me from Quilt Market with the Sample Spree sign?)! So what do y'all think? Hey all! How's it going? As I mentioned on Sunday I headed to Creativ Festival here in Toronto after work on Friday night and picked up a few goodies for myself. Creativ Festival occurs here twice a year - once in the Fall downtown and once in the Spring a little further outfield - I've been going to the Fall one for the past three years and went to the Spring one for the first time with my Mum in April. Fall is definitely the better of the two - it's huge, really easy to get to since it's on the subway line, and there is way more selection in terms of fabric and yarn and other crafting supplies. I picked up this lovely fat quarter bundle of Silent Cinema by Jenean Morrison for Free Spirit from the Log Cabin Yardage booth - isn't it just so pretty?! 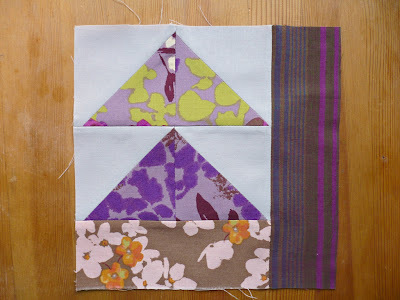 I love the colours and I'm already dreaming up some ideas of what to do with it. I picked up one other thing at this booth but I can't show it right now because it's part of a Christmas present for my Mum and if I showed it it would be absurdly obvious what I'm making for her. 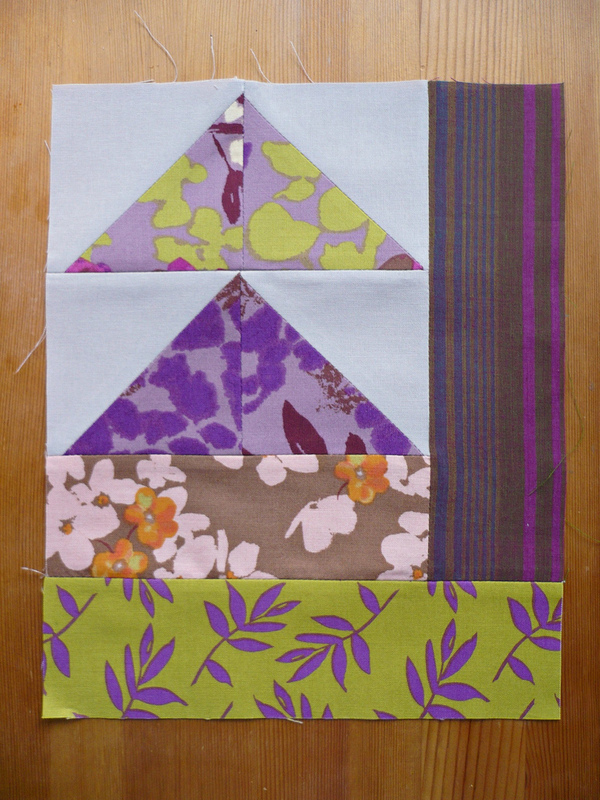 These four fat quarters from Patty Young's Sanctuary collection for Michael Miller came from the Sew Sisters booth. I always stop by to say hi to Judy, the owner of Sew Sisters, first because she's a nice lady and always has great fabric at great prices! I would have bought more from their booth but it's always so busy that it's hard to see everything! 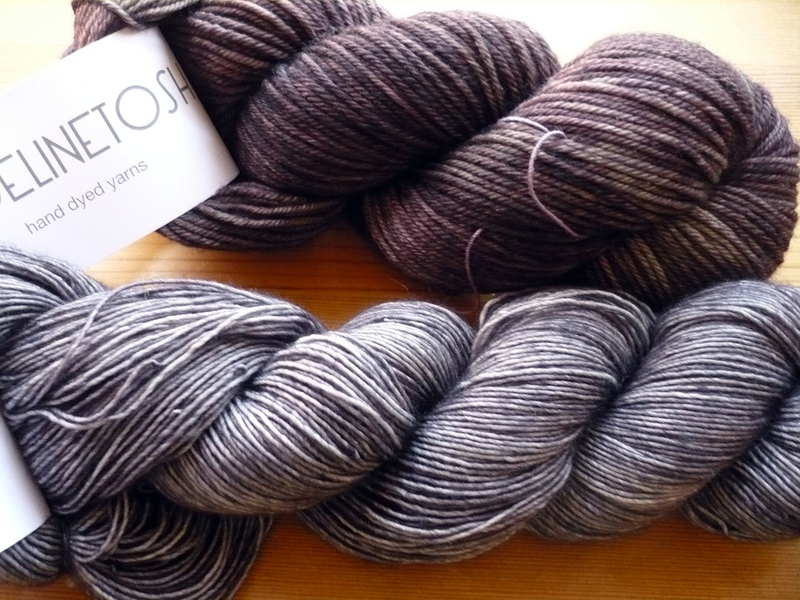 I didn't buy any yarn this year because I was trying to be good - ya know, a girl's gotta draw the line somewhere! I saw some Viola in person for the first time and almost succumbed to it's beauty and the Sweet Georgia was calling my name too but I held strong! 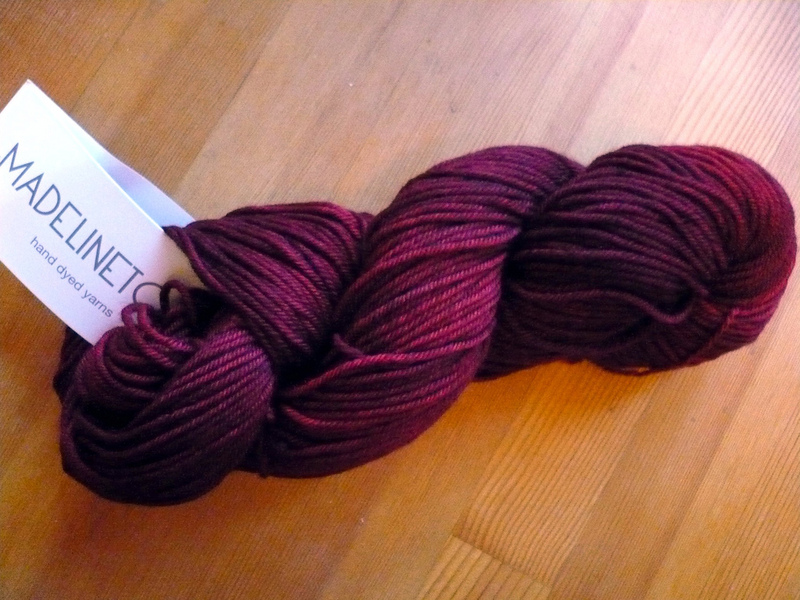 I did however buy a skein of Madelinetosh's 80/10/10 MCN worsted in Tart when they had their free shipping sale a few weeks ago (Madelinetosh offers free shipping in their Etsy shop on Fridays every once in awhile). 80/10/10 is a superwash merino/cashmere/nylon blend and is one of their special bases - their special bases are only available through their Etsy. I have no idea what I'm going to knit with it but it is just so pretty that I couldn't pass it up! 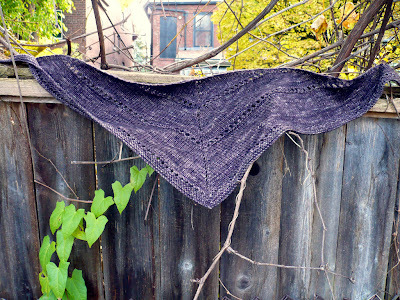 I finished knitting Ysolda Teague's Damson shawl this week which is a holiday gift for someone I know but I haven't had the chance to get any pictures yet since it's getting pretty dark here by the time I get home from work every night - hopefully Alex can help me take some pictures this weekend! 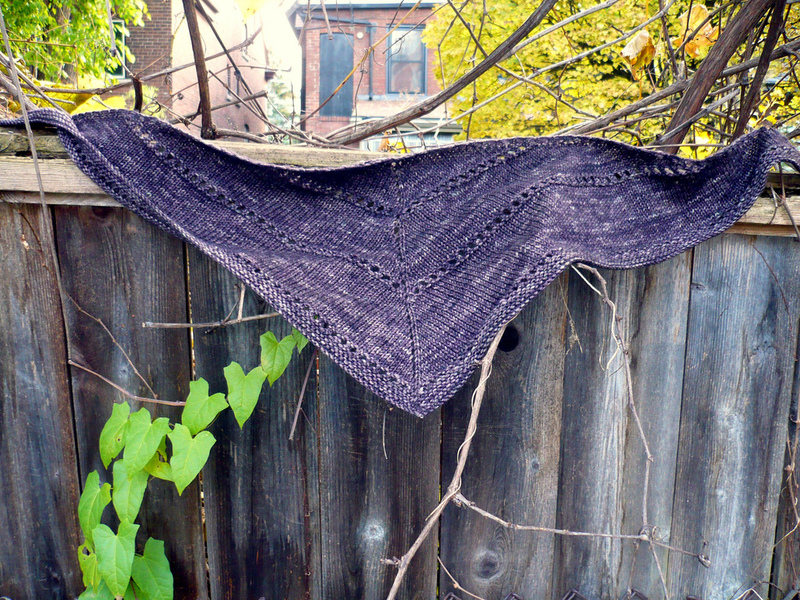 Hmmmm, that also reminds me that I need to get some pictures of the Age of Brass and Steam Kerchief that I knit...oy, I really need to be on the ball a little more! Oh geez! I forgot one of the most exciting things I picked up at Creativ Festival (but I didn't take a picture). I got a new Janome walking foot to replace the one that exploded - woot woot woot! Now I can finally get back to actually quilting things and I can finish up the one I was quilting when the disaster struck - hurray! Hey all! Sorry I wasn't able to do this post yesterday as promised but I spent most of the day in bed with a migraine - boo!!! I still have a little bit of it today but it is definitely much better! I was going to do a little recap of Creativ Festival but that will have to wait until another day when I have strength enough to take pictures of all the little goodies I got. 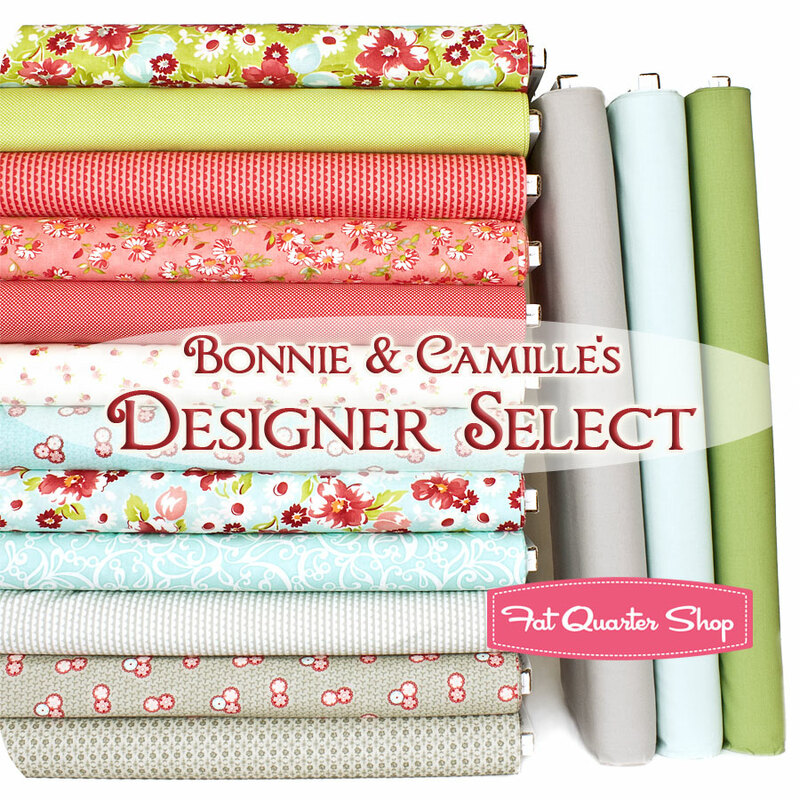 For now though I will announce the winner of Bonnie and Camille's Designer Select fat quarter bundle from Fat Quarter Shop... drum roll please! Woohoo, go Amy! 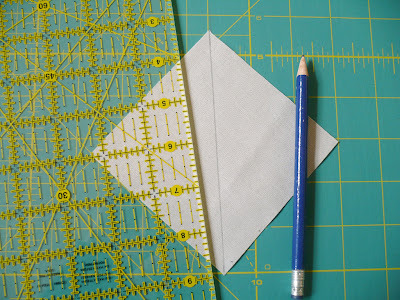 You guys Should all check out Amy's blog, Stitchery Dickory Dock, it is super-cute, she has some great tutorials, and I am super-jealous that she was able to make it to Sewing Summit! 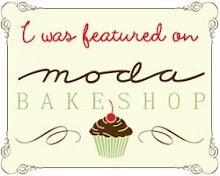 Amy, please send me an email with your mailing address and FQS will get your prize out right away! 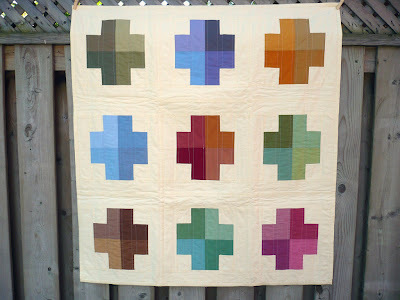 It seems like people are really interested in doing a quilt along for my Colour Block Cross quilt so I think we'll get going on that! I need to work out some logistics and then I'll announce all of the dates, etc here on the blog - this is going to be so fun guys! In honour of finishing the first week at my new job, my lovely sponsors Fat Quarter Shop and I are teaming up once again to bring you another Designer Select Fat Quarter Bundle giveaway! 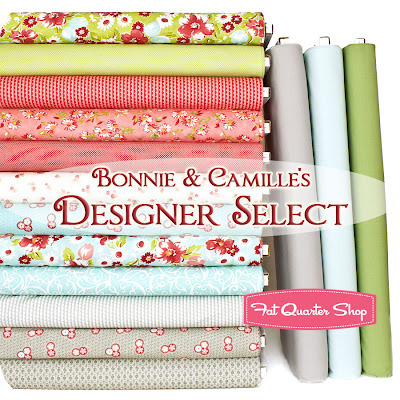 This time we've got Bonnie and Camille's Designer Select! 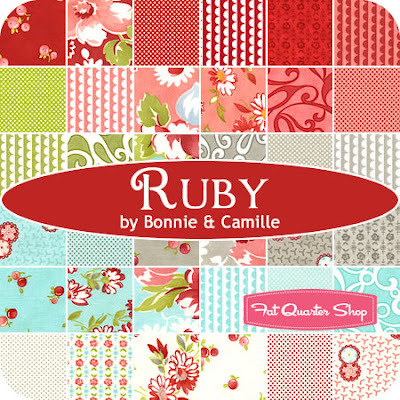 This fat quarter bundle features twelve prints from Bonnie and Camille's recently released Ruby collection for Moda and three coordinating Bella Solids. Ruby is an absolutely stunning collection and I just love it! Don't you guys think it's gorgeous? 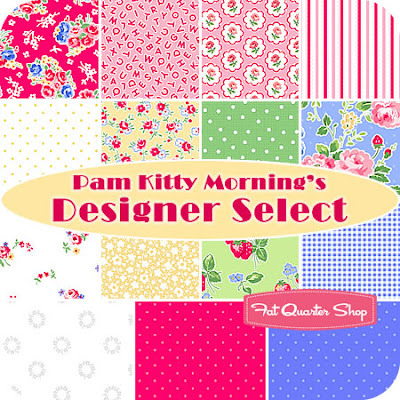 I really wish that I could keep the designer select bundle for myself by alas I guess I will pass it on to one of you lucky ducks! I'm positively swooning over the greys! from Fat Quarter Shop is your favourite. That's it - two very simple ways to enter! I will close the comments in a week (on the 22nd) and announce the winner here on the blog. International entries are, as always, welcome! Also, please remember that I have comment moderation enabled so if you don't see your comment right away it just means that I haven't had the chance to approve it yet (duplicate comments will be deleted). Okay I gotta go! I have plans to sew up a storm today and bake some Pumpkin Chocolate Chip Cookies - I think the latter of those two will make Alex very happy! Hmmm, it's October 7th, I wonder what that could mean?! Here it is folks, as promised on October 5th, the full reveal for my pattern that is in the special Fall issue of Fat Quarterly! 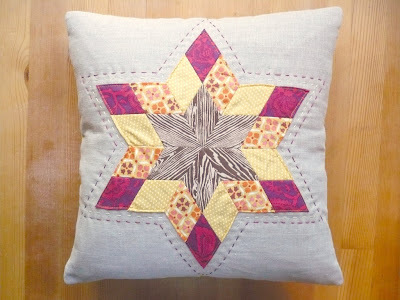 This is the Falling Starburst Pillow! Here's a little snippet from Fat Quarterly of what I had to say about this little pattern and the inspiration behind it... "Fall is my favourite time of the year - Thanksgiving, my birthday, halloween, crisp cool breezes, amazing colours, pumpkin everything, and hot apple cider! What's not to love? 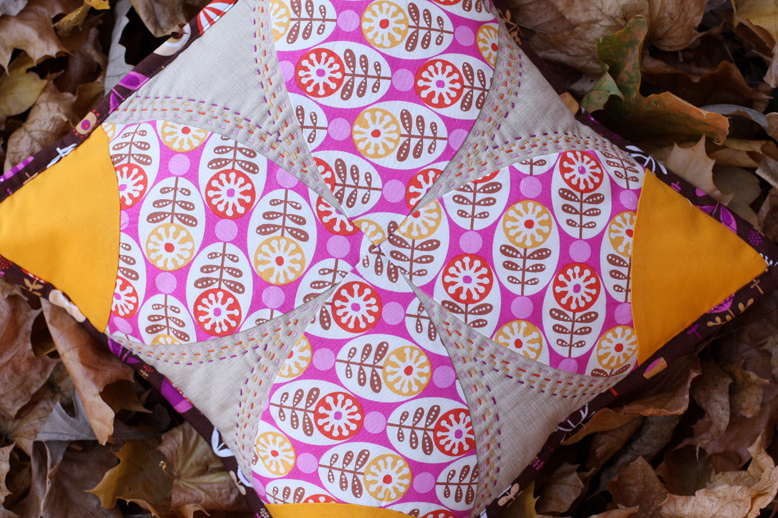 My fall inspired pillow pattern aims to reflect the natural and simple - but glorious - beauty of fall with a mix of hand piecing, hand quilting, and natural linen." 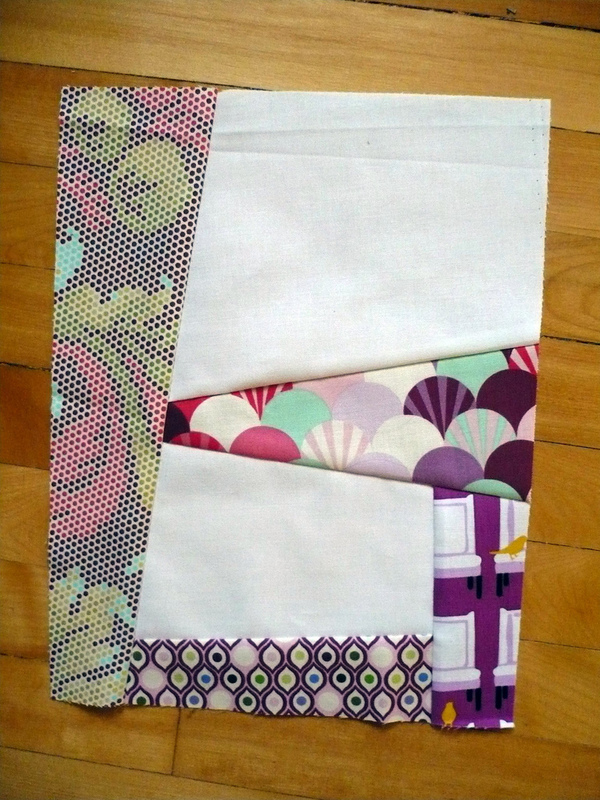 The fabrics used for this pattern include a mix of natural linen and prints from Denyse Schmidt's Flea Market Fancy, Tula Pink's Parisville, Oliver + S's City Weekend, and Joel Dewberry's Aviary. 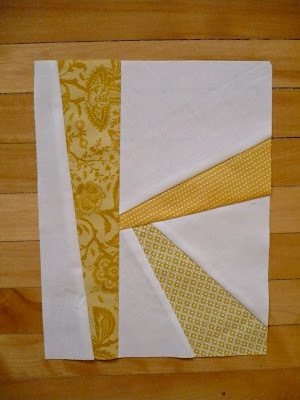 I used #8 Perle cotton in golden yellow and deep crimson shades for the hand quilting. This very special "Fall-Inspired" issue of Fat Quarterly is available as a PDF-download on the Fat Quarterly website for a very special price too - only $5! Woot! 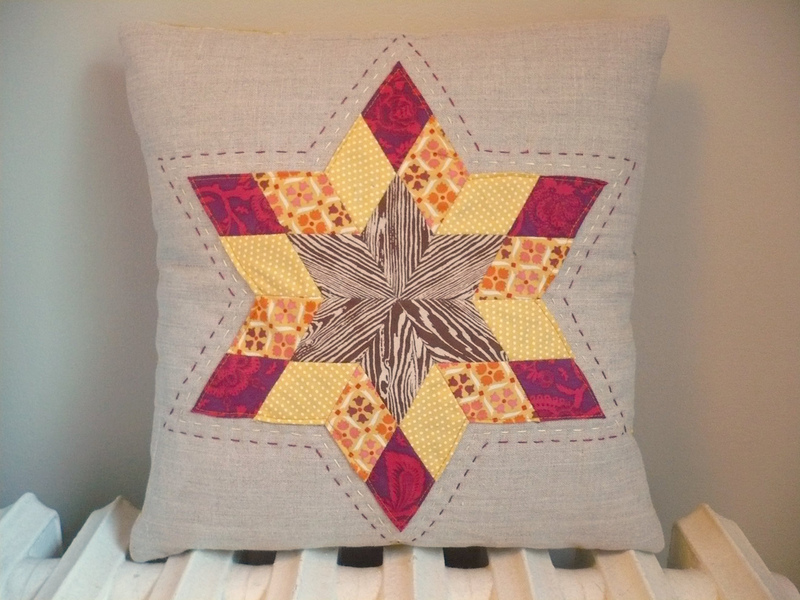 This issue includes four quilt patterns, four bag patterns, and five other patterns - including my pillow (of course!) 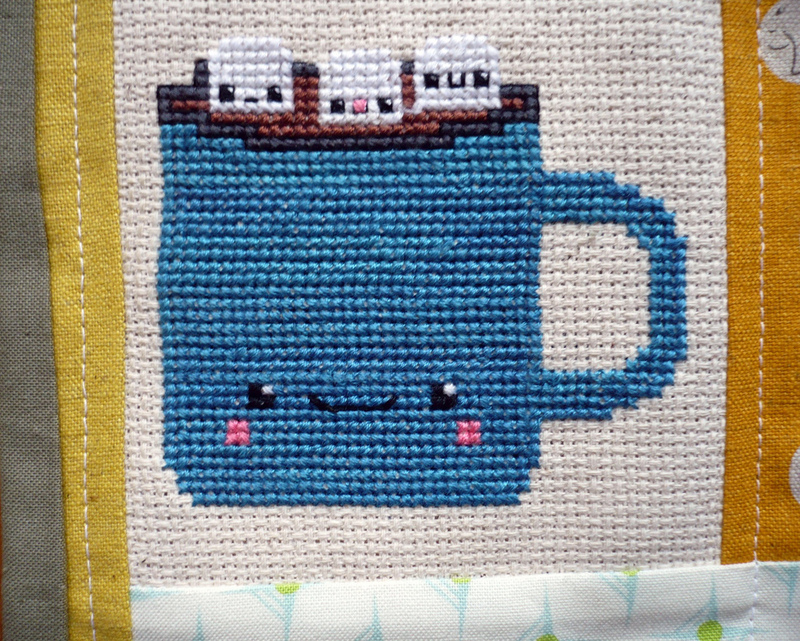 and a new xStitch pattern from the folks over at The Frosted Pumpkin Stitchery! So what do you guys think? Do you like my little pillow? Would you like to stitch one up for yourself? 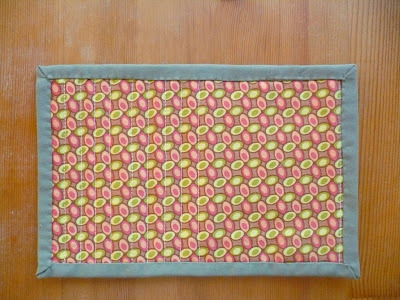 This is a great pattern for curling up under a quilt to stitch, maybe while watching the BBC, and sipping some peppermint tea - I know, because that's what I did when I was making it *wink*! Head on over to the Fall Inspired page at Fat Quarterly if you so desire! And don't forget that if you make something from this pattern you can post pics in both the Fat Quarterly and Miss Print groups on Flickr! Welcome everyone to the second day of the Quilt Uber-Fest quilt along! I'm really glad that you're all joining me here today and I can not wait to see the blocks that y'all come up with over the next little bit. 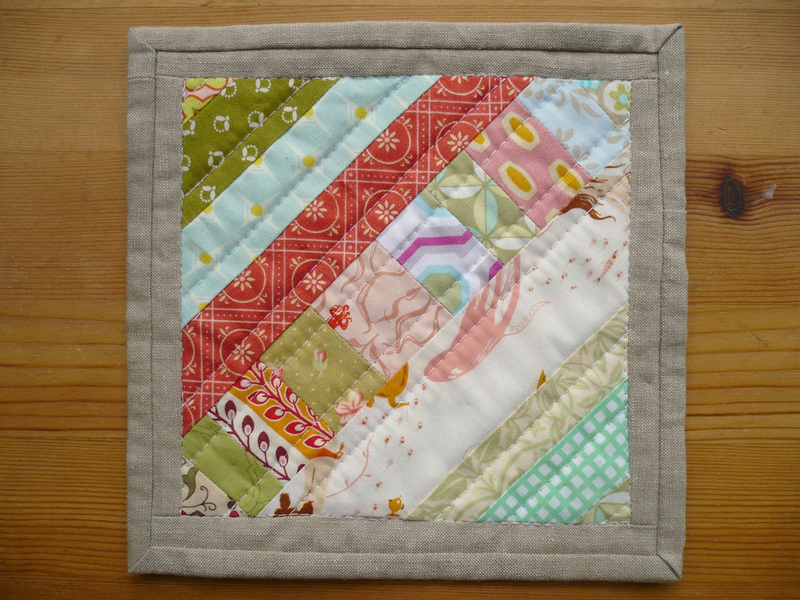 I've called my block design "Flying North" because the flying geese and log cabin motif reminded me of Canadian geese flying over sections of farmland. 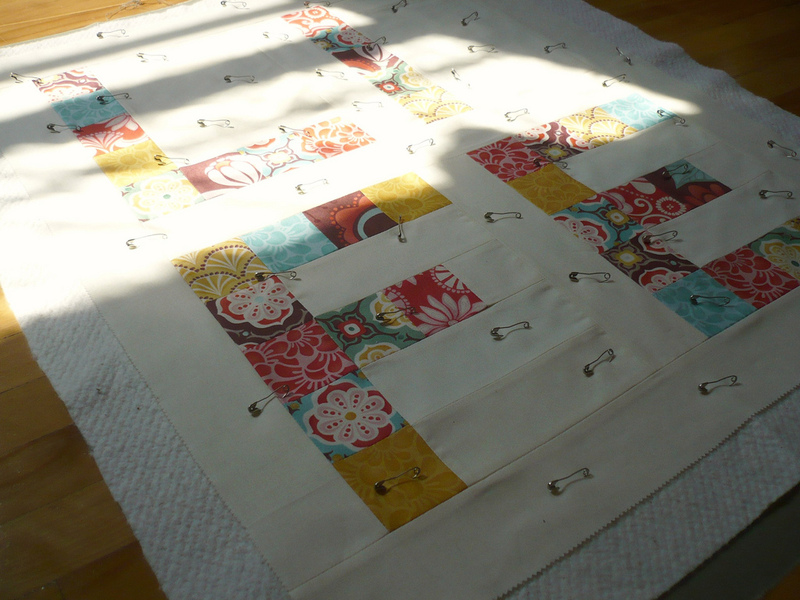 *Note: All seams are 1/4" and please remember to press in between each step. The block will end up being 12.5x12.5" square with a finished size of 12x12" square. 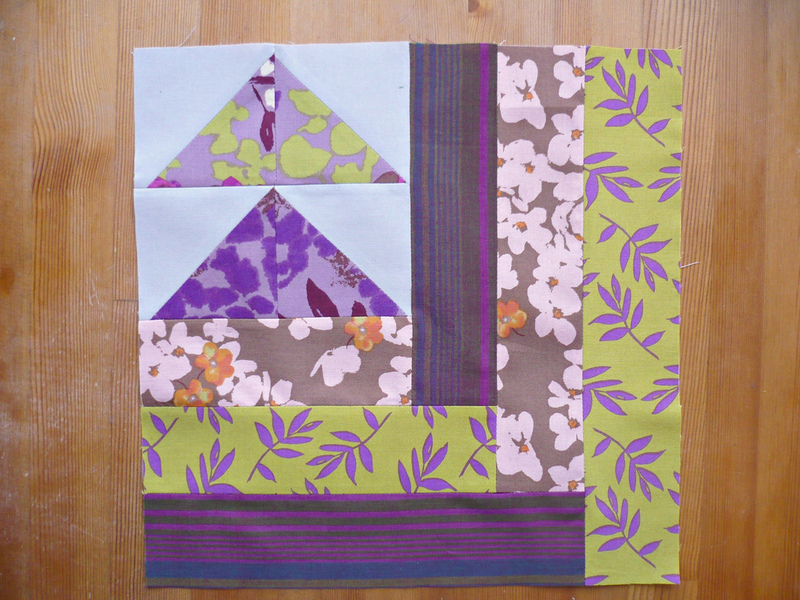 -Cut two squares measuring 4x4" from each the Kona Ash solid and one Sleeping Beauty print (I used print #PWNW013Purple) for a total of four squares. -Cut one 2.5x6.5" strip and one 2.5x10.5" strip from one Sleeping Beauty print (I used print #PWNW017Brown). -Cut one 2.5x8.5" strip and one 2.5x12.5" strip from the last Sleeping Beauty print (I used print #PWNW015Purple). 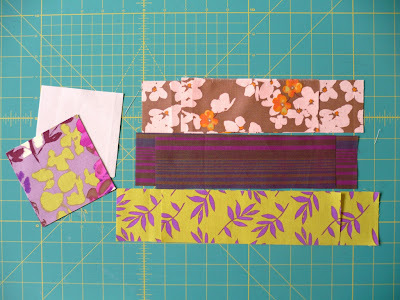 -Cut one 2.5x8.5" strip and one 2.5x10.5" strip from the Kaffe Fassett woven. -Draw a line diagonally from point to point on the wrong side of your two solid squares. 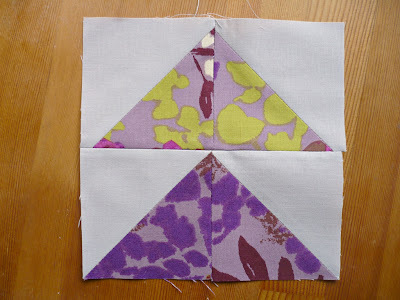 -Pin a solid block, right sides together, with a print block and sew 1/4" away on either side of the diagonal line. 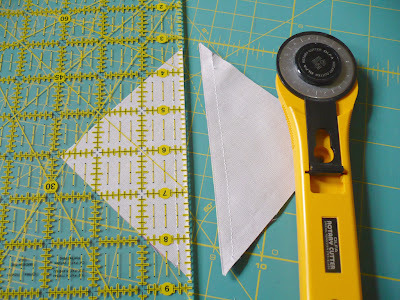 -Using your rotary cutter or a pair of scissors cut the square into two triangular pieces using the original line that you drew as your guide. 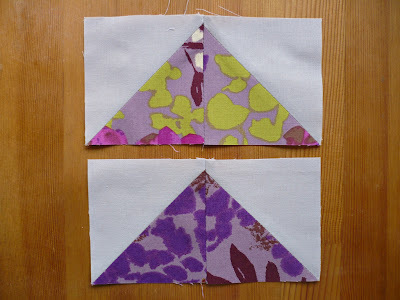 -Open up each triangle and press the centre seam open. Trim each block if necessary to 3.5x3.5" square and cut off the little nubbins that are jutting out. -Repeat the above steps with your remaining solid and print blocks until you are left with four half-square triangles. -Layout your HSTs as shown above. -Take each of your sets of matching HSTs and sew, right sides together, along the joining edge. 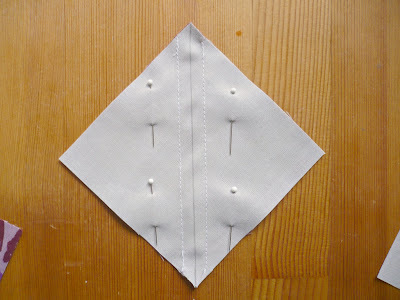 -Now that your two geese are constructed place them rights together and sew along the centre joining edge. 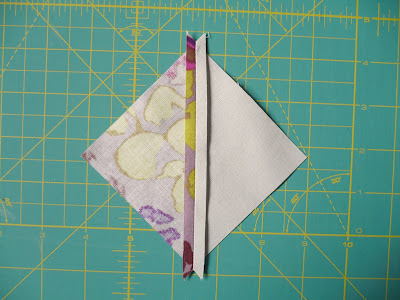 -Sew your 2.5x6.5" strip, right sides together, to the bottom of the flying geese. 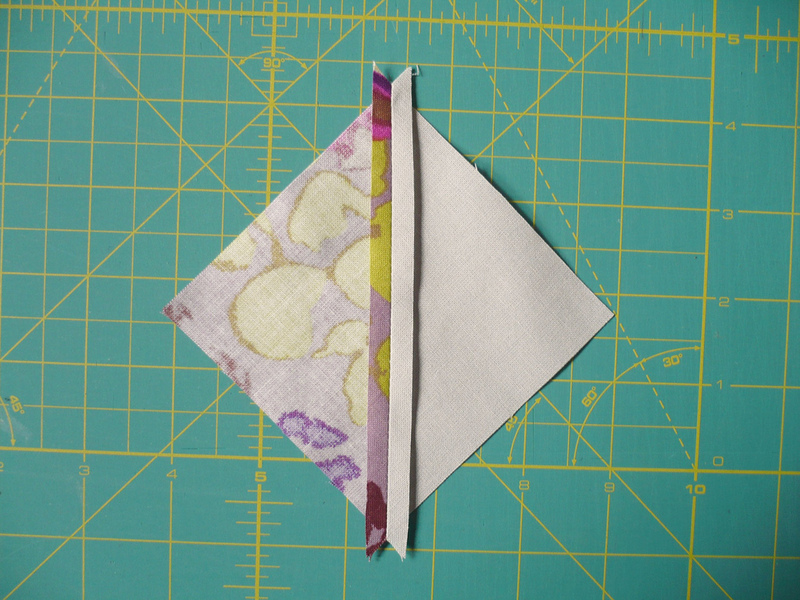 -Sew the first of your 2.5"x8.5" strips, right sides together, to the right side of the flying geese. -Sew the second of your 2.5x8.5" strips, right sides together, to the bottom of the block. 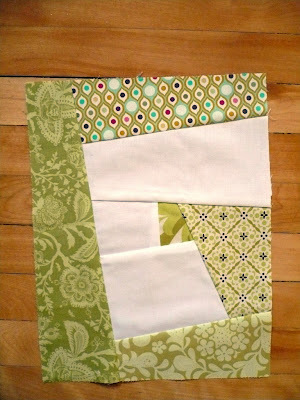 -Sew the first of your 2.5x10.5" strips, right sides together, to the right side of the block. -Sew the second of your 2.5x10.5" strips, right sides together, to the bottom of the block. 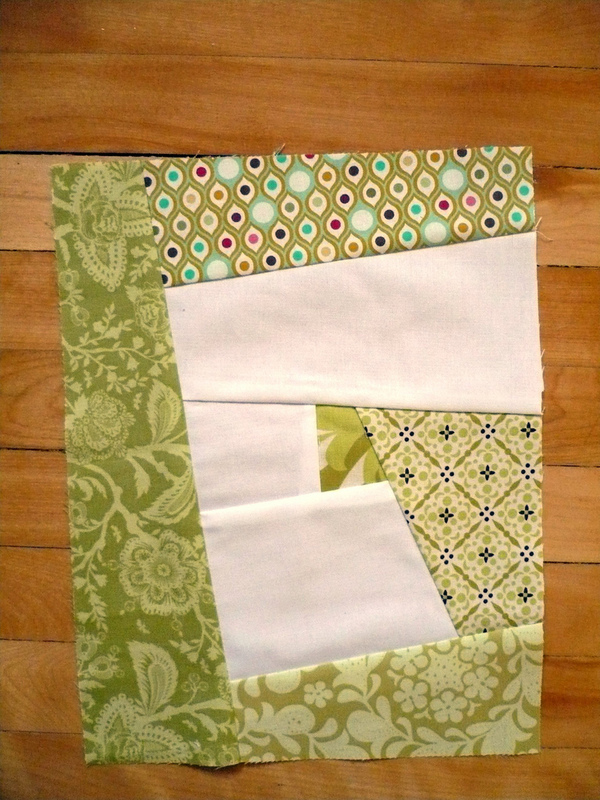 -And finally, sew your 2.5x12.5" strip, right sides together, to the right side of the block. Look at that - you're done! I hope that you all enjoyed being here and that you've also enjoyed making "Flying North" with me. I've turned this tutorial into a PDF too which you can find here! 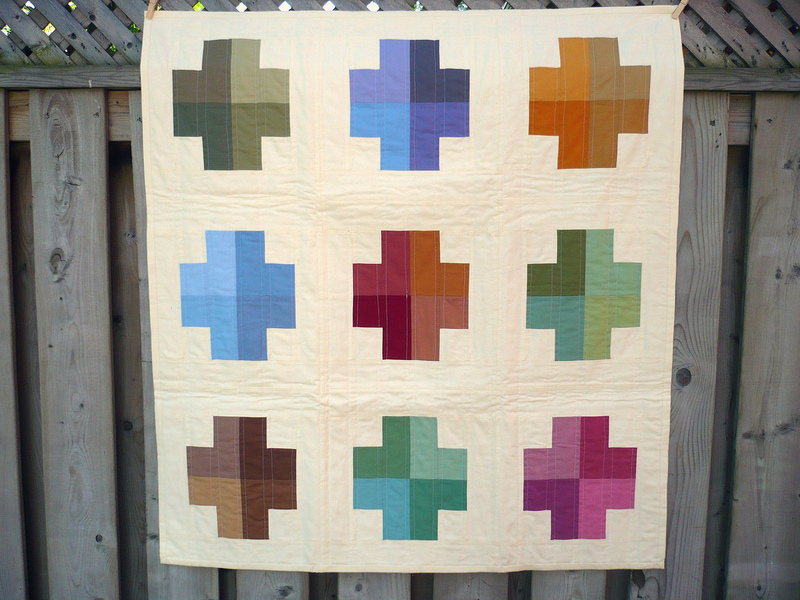 Remember to add photos of your completed blocks to the Uber-Fest Flickr group and please come back and visit anytime you'd like! 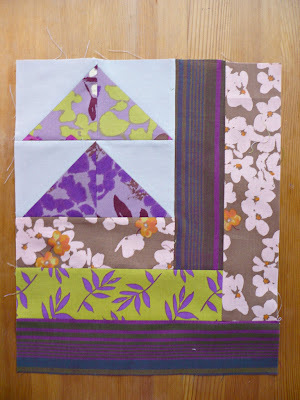 Also, add your block to the Miss Print Tutorials and Patterns Flickr group if you'd like too! 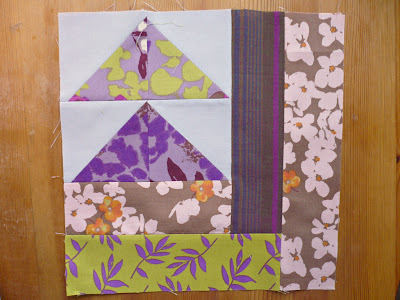 Next up with block three tomorrow, we have: Karen Linton who, since she does not have a blog, will be guest posting the tutorial on Scott's blog!